audience. This is even more vital when communicating on issues rather than marketing products or brands. Everybody has standards of behaviour and an idea of what is important in life. Framing communications stimulates these values. Unsure of your audience’s fundamental values? Why not go ahead and ask? In this age of social media and the sharing economy, many successful brands do just that. Framing a painting focuses attention on the artwork it surrounds. By framing a campaign, values are stimulated that can motivate engagement. 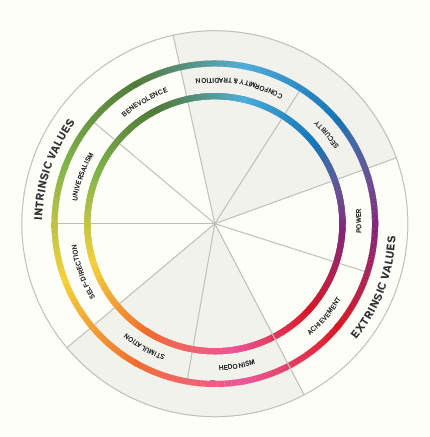 Everyone holds both intrinsic and extrinsic values. However, studies show intrinsic values are more prominent across diverse backgrounds because they are gratifying to pursue. This is why research, led by Common Cause, argues that promoting intrinsic values results in communications which are not only ethical but also more effective. Communications should be consistent in their messaging. Framing your message with conflicting values will disengage audiences. So communicate a coherent set of values. For instance, food is not only a source of nutrition. It can also be socially ethical, a form of expression and can help build community. However, by reinforcing mixed values such as creativity and family security, a campaign may confuse audiences. It is more difficult to pitch a product to consumers who do not want it. This is why many campaigns opt for the ‘easy sell’ approach, often using financial and material incentives. These encourage extrinsic values, which in the long-term can hamper sustainable behaviour. We believe that sustainability communications should be consistent, transparent and ethical. Don’t shy away from offering a more honest picture in your communications. Promoting the wider issues rather than products can motivate change more than you might think. Blog by Richard Delahay, Communications Assistant at Sustainability Consult.